How to improve the quality of your life? We all desire a happier and more rewarding life. In that we often strive to improve specific details of our lives – get a better job, own a bigger home, spend more time with our friends and family, get in better shape, and so on. While it is important to work on these focused goals, it is important to take a step back and look at our lives as a whole and determine if our individual goals contribute to our long-term happiness. It is easy to assume that a goal such as striving to get a better paying job is something we want, but we may find that we are just following a pre-programmed path set by the expectations and influence of others or even the media. It would be a tragedy to struggle for years to achieve a goal only to find that is detracts from you happiness instead of contributing to it. Once you take a step back and consider what you want to achieve in life, the complexity of the problem can be daunting. When faced with a large goal the best thing to do is attempt to break it down into smaller more manageable goals. You may need to establish another levels of goals below these as well if they are still too daunting. Once you have a list of goals, you will need to determine that actionable tasks you need to achieve those goals. Even then if there are tasks that appear too big to tackle, you can break those tasks down into smaller sub-tasks. There is no limitation on how small the tasks should be. They need to be small enough so that you feel that you can easily accomplish them. This is just a high level overview on the process of goal setting and tasks. We will expand upon the topic of goal setting in a future article. 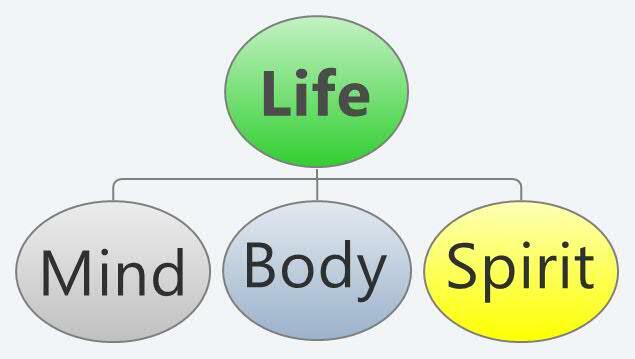 The first step that I take when editing my life goals, is to consider the three main aspects of my being that I want to improve which are mind, body and spirit. While the more pragmatic may feel that this is little too “new-agey”, I want to assure you that I will strive for practical advice based on both quantitative and qualitative research as well as my own personal experience. The word “spirit” has religious connotations, but in this context this word encompasses the topics of passion, drive, motivation and purpose. The concepts of mind, body and spirit are very useful when setting goals. In practice, however, most goals will address more than one of those. Though exercise is often considered a way to improve the body, it also improves the mind and spirit as well. Most of the advice I will provide on this site will be based on work done by others. For years, I have researched the fields of self-improvement, productivity, business and anything else that would help provide the answers I had been looking for. I will continue to research in my endless mission to improve my life and the lives of others. In those years my life has had many challenges and I attempted to apply what I’ve learned to those challenges. I’ve achieved great things as a result. I’ve also found that some of what I’ve learned was faulty or incomplete. I don’t begrudge those who shared that faulty information as I believe most offer the best that they know and it was up to me to find my own answers. I will do my best to share what I’ve learned but it is important that you remain skeptical to my advice or the advice of anyone else. You have to find what works best for you, but to do that you need to consider what others have to share. If you figure out a better way of doing things, I ask that you share that with others. Nobody has all the answers. We often see experts publish a book one year only to produce an expanded edition some time later. Were they holding out on us? I don’t think so. The publish a new edition because they’ve gained more knowledge, more insights and have had more time to apply their ideas in the real world. I’m sure they also get feedback from others about how their advice didn’t work as they expected and that they needed to make changes to meet their personal circumstances. Not only do I not have all the answers, I still have many more questions of my own to figure out. Still, I am absolutely certain that if you try some of the ideas I will share with you, you will learn ways to improve your life. When you do experience success, it won’t be because of anything I’ve shared, but rather due to your own efforts to apply what you’ve learned. I have witnessed both the positive and negative aspects of competition. Personally I’ve always disliked the notion that “I beat you” or “You beat me”. Either way someone is getting a beating. In terms of game play, where the stakes are low and the main purpose is to have fun, competition can be positive even when losing. In the workplace, when dollars and promotions are on the line, competition can be detrimental to building a highly productive team. In personal relationships competition can end marriages, friendships or cause families to drift apart. The real winners don’t focus on the competition they focus on their own abilities. If a winner watches a competitor it is to learn new ways to better themselves and not how to be better than others. When a person or an organization focuses on the competition they are always trying to do the same thing but better. By the time they succeed in that field, their competition has already moved on and is now doing something completely different. By focusing on the competition, at best you are only trying to be a little better than your best competitor. This creates a false sense of security because the competitive individual is at risk of being overshot by someone else who is driven from within to excel at a particular activity or endeavor. When that happens, the competitive cycle begins again. Years ago, I decided to take myself out of the competitive career game, I had had enough of it. Instead, I decided, I was going to focus on enjoying my work and try to do the best that I could do regardless of where I stood among my competitors. The results were amazing. I had no idea how much effort and aggravation was wasted on trying to keep up with others. Once I left the game, I had a sharper sense of focus and motivation in achieving what I wanted to achieve. Now that I stopped competing with my peers and coworkers, I can see how bad competition can get. I’ve heard seemingly close friends speak poorly of each other to build their own image with management. I’ve known grown adults argue at great lengths over who had the authority to order a few reams of paper for the printer. I knew a manager who told the department’s system administrator not to give networks access rights to another manager’s team in an attempt to wield power over the other. I do believe there can friendly, positive competition, especially when the results are positive for all regardless of who wins. You can lose a game, or fail to be given the lead role on a project and still come out with positive benefits. Winning should be about gaining the most, not suffering the least. Most people are living under the illusion of false limitations. They are quick to believe that they can’t do something or that they can’t succeed beyond a certain level. Even when given evidence of having accomplished goals that they thought beyond their abilities, they are quick to brush it off as “good luck” or a fluke. When my 3 year old daughter is trying to learn something new she sometimes gets frustrated and cries out “I can’t do it!”. I wonder where that’s coming from because I’m careful never to use the word “can’t”. I believe the concept of self limiting belief is ingrained in our society. The truth is that there is very little the average person can’t do. I’ve seen people who have been obese their whole lives manage to lose the weight and keep it off. I’ve seen uneducated, single moms go back to school and eventually begin a fulfilling career. I’ve known people who were once drug addicts but had kicked the habit and now live a clean, healthy lifestyle. If you are passionate about a particular goal it is within your abilities to accomplish it. If there are feelings of self doubt it is because deep down you know you can do it but it is contrary to your self limiting beliefs.